Bacon cheeseburger pizza. Because sometimes it’s just too difficult to choose between a bacon cheeseburger and a pizza. But knowing how particular some of you are about the toppings on your cheeseburger, we want to give you permission to toss on some tomato, lettuce, or additional cheese after you pull this pizza from the grill. We didn’t because we’re purists. But go on. Make it your own. 1. Preheat your gas grill by opening the lid and setting all the burners on high. Close the lid and leave the grill on high for 10 minutes, then reduce the heat of all the burners to medium. 2. Meanwhile, in a large skillet over medium-high heat, mix together the ground beef, Worcestershire sauce, mustard, onion powder, salt, and a pinch pepper. Cook, stirring occasionally and breaking up any clumps of meat with a spoon, until no trace of pink remains. Let cool slightly. 3. Lightly brush the onion slices with 1 tablespoon oil and season with salt. Place on the grill over direct heat and cook until browned and slightly softened, 2 to 3 minutes per side. Transfer to a plate. 4. Generously sprinkle a pizza peel or the underside of a baking sheet with the uncooked polenta, grits, or cornmeal. Place the dough in the center of the work surface and roll it around until it’s evenly coated and then generously drizzle the dough with the remaining 2 tablespoons oil. (If making individual pizzas, divide the dough into 4 equal portions.) Roll the dough with a rolling pin or stretch it out with your hands, being careful to press it out from the center, until the dough is 1/8 to 1/4 inch thick. Don’t worry about making it perfect—organically shaped crusts are part of the charm of grilled pizza. 6. Use tongs to transfer the crust from the grill back to the peel or the upside-down baking sheet. Immediately close the lid on the grill to keep it at the ideal temperature. 7. Flip the crust to reveal the grilled side. Spread the tomato sauce evenly over the crust. Top with the ground meat mixture. Place the squares of cheese on the pizza, arranging 1 square on each quarter of the pizza, making sure they don’t overlap. (If making individual pizzas, place a single slice on each pizza.) Top the pizza with bacon and grilled onions. You want the pizza to resemble a bacon cheeseburger. 9. Remove the pizza from the grill, season with salt and pepper, and garnish with pickle slices. Slice and serve immediately. Build a fire by lighting 50 to 60 charcoal briquettes either in a chimney starter or in a pyramid-shaped mound on the bottom grate of your grill. Once the briquettes have become gray-ashed, which usually takes 20 to 30 minutes, move them all to one side of the grill. Move the pizza dough close to the grill and pick it up by the corners closest to you. Working swiftly and in a single motion, place the pizza on the cooking grate, starting by lowering the dough at the back of the grill grate down first and ending at the front. Close the lid and grill for 4 minutes (no peeking!). Rotate the crust 180° and continue grilling until the bottom of the crust is well marked and golden brown, another 2 to 3 minutes. If your grill cooks unevenly, finesse this by rotating the crust again and/or moving it to another section of the grill. (Once you become comfortable making pizza on the grill, this part of the process will become second nature to you.) Remove the crust, flip it over, and follow the recipe instructions above for topping the crust. Transfer the pizza back onto the grate over the side without briquettes and grill, with the lid on, for 4 to 5 minutes. Rotate the pizza 180° and continue to grill with the lid on until the bottom is golden brown and crisp and the cheese is melted, another 4 to 5 minutes. Remove the finished pizza from the grill, garnish, and season as directed. Slice and serve immediately. I was trying to decide what to have for dinner and mentioned this Bacon Cheeseburger Pizza recipe to my teenagers, and before I could even say any other options one son said, "We don't even need to hear the other choices." They'd invited several of their friends over, so I read and reread the recipe, worried that this would be difficult and that I would end up with lots of smoke and fire in the backyard and no dinner. I even bought backup burger buns in case the dough fell through to the flames. I was pleasantly surprised at how easy and wonderfully this recipe came together! You can prepare everything ahead of time, so it would even be a great recipe for a last minute dinner. I made the pizza dough recipe I have made before from this site that's linked to in the recipe and ended up using cornmeal instead of grits or polenta. Since my teens don't like red onion, I made the minor adjustment of using a Vidalia onion. It didn't take much oil to coat the rings, so I'd say 1 tablespoon is very generous. I put a skewer through my smaller rings to keep them from falling through the grate, and although I'm not sure this was necessary, it made turning them very easy. For my one picky son, I may only put them on part of the pizza or chop them and add them to the meat next time. The scary part for me was putting the dough on the grill. My dough stretched out a little when I put it on the grate. After 3 minutes with the lid closed, I was so anxious to see if I had a mess on my hands. It was like opening a gift to see the lovely lines from the grill and perfect crust starting to take shape. After just one time doing this, I already feel comfortable enough to do it again. After flipping the dough, I added the toppings. My rectangle was a little more of a parallelogram but it still worked. One great little aesthetic bonus of doing the pizza this way is the edges of the pizza that aren't covered with sauce and toppings still show the grill marks and give it a wonderful rustic appearance. I had a hard time fitting all the meat on the pizza, so I'd definitely consider this a meat lovers' pizza. It was a huge success. My reviewers all agreed it was great as presented. Their only suggestions were to include individual toppings or cheese preferences, as pizza and burgers are both things that most people like to personalize. Their ideas were to have fresh tomato, shredded lettuce, jalapeños, and maybe Colby Jack cheese on hand. But it's truly wonderful exactly as written. When summer starts, I always hate the idea of heating the oven to very high temperatures, but this is the perfect recipe to keep the heat outside. Cheater, cheater, pizza eater. Daunted by making your own dough and flipping said dough over a red hot grill in 95° temperatures? Me, too. Here’s the solution: this bacon cheeseburger pizza. Early in the day while the kitchen is cool and the house is still asleep, fry the bacon, cook the meat and make your own tomato sauce. (That simple tomato sauce linked to from the ingredient list? Yep, it lives up to its name and is as easy as opening a few cans of tomatoes. Guess what? The hard part is done AND you will have enough tomato sauce left over to toss with some fresh pasta for another night’s dinner. Two dinners done. Give yourself a big pat on the back and go enjoy the day. Maybe turn on some Jimmy Buffett. Cheeseburger in Paradise would be perfect about now. Then fix yourself a nice cold margarita. Okay, time to cook. Fire up the grill and cook the onions. Wipe your brow, take a swig of that margarita, and toss a big piece of flatbread or even a nice store-bought thin crust on the grill. Come on and cheat, it’s really hot out there. Leave on the grill just long enough to lightly toast the bread and get some pretty grill marks. 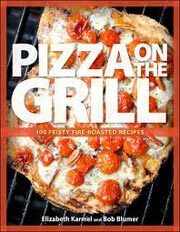 Load up your cheater pizza, toss back another slurp, and grill indirectly until the cheese is all melt-y and gooey. You’re all done. Go look for that lost shaker of salt. This recipe brought me back to the favorite foods of my youth–pizza and cheeseburgers—all combined in one time-traveling bite. It worked really well on the grill. The cheese and crisp bacon are the perfect toppings for this youthful recipe. 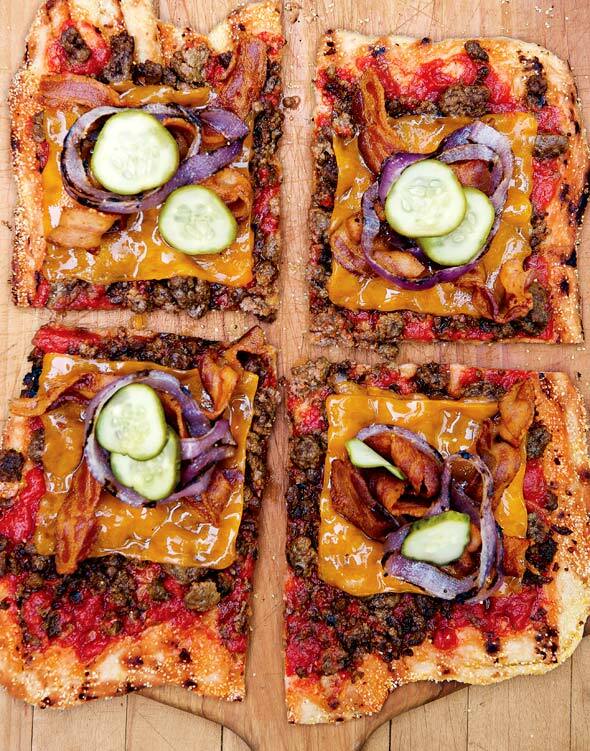 Bacon Cheeseburger Pizza Recipe © 2014 Elizabeth Karmel and Bob Blumer. Photo © 2014 Christopher Hirsheimer. All rights reserved. All recipes and photos used with permission of the publisher. Renee, it’s my utterly pleasure. Thanks for being a loyal LCer!